During the EAGLES Gala, the most important awards of Polish film industry presentation, that took place on the 2nd of March 2015, members of the Polish Film Academy have called to release Oleg Sentsov, an Ukrainian director imprisoned in Moscow without a trial for protesting against the Russian annexation of Crimea. 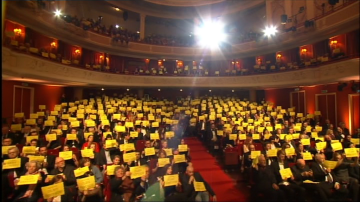 At the request of Dariusz Jablonski, President of the Academy, the best Polish filmmakers and honorary guests raised yellow placards reading „jestem OLEG SENTSOV”(„I am OLEG SENTSOV”) on it in an act of solidarity. Olena Leonenko, a Polish artist born in Kiev, told Oleg’s story to the guests present at the ceremony and audience of the Chanel 2 of the Polish Television. The young director, whose first film, ‘Gamer’, was shown at many European festivals, publicly protested against the annexation of his native Crimea. Arrested and taken to Moscow, he is being held in the Lefortovo prison without a trial for over 9 months now. He faces 17 years in prison for acts of terrorism. As he himself stated in his speach in court screened at the ceremony, despite beating, torture and humiliation, he did not confess to any of the charges and did not renounce Ukrainian citizenship. Previously, the Polish Film Academy took part in the European filmmakers’ protest against Sentsov’s imprisonment and the collection of money for parcels, led by European Film Academy. On its website, the Polish Film Academy presents a pictures of distinguished Polish filmmakers standing with “I am OLEG SENTSOV” placard in front of a photograph of Oleg Sentsov standing behind bars. The Polish Film Academy will shortly be providing an account for any people wishing to contribute to parcels for Sentsov. The Polish filmmakers’ act of solidarity during the most significant film awards ceremony in Poland, broadcasted by the 2nd Chanel of the Polish Television, and whole action of PFA, has been widely commented by the Polish media.